In 1728, in Campo Salentino, Anna Palazzo was bit by a spider while working in the vineyards and promptly collapsed. She was hauled into her bed and the doctor Nicola Caputo wrote that he called the only people who could still save her: the musicians. 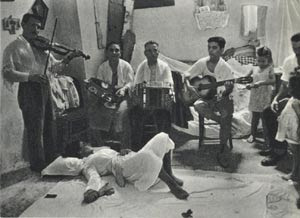 The famed dance ‘the Tarantella’ is derived from what is about to play out – musicians playing improvised music to meet the staccato shaking dance of ‘la tarantata’ – the woman bitten by a spider. While some trace the deeper tendrils of the dance to ecstatic ritual dance as part of the Greek Dionysian cult the research on that is thin. Modernization has ended the tradition that emerged from the fields of Salentino. The places where communities would come together and listen and play and worry and feed and dance for the well being of one of their kin. While there seem to be no more La Tarantata emerging, the land that made the pizzicata music that was played to these women is still there. Perhaps an ear is tuned there and a skin tender enough that this old tradition might emerge again. Here at Primal Derma we love these old ways that are gone and not entirely gone. Using tallow for skincare was virtually eliminated due to industrialization and other issues…and yet here we are. If you want a bit of the old ways on your skin, we’d love to help you with that. And when you head off to Salentino next, keep an eye out for spiders and pray you get bit. You may need to dance for a few days. Who doesn’t need that?